Are the French people friendly? How's the Weather? Why do you keep coming back to Paris? I've noticed, for the most part, Parisians are detached, unsmiling and relatively efficient. I was at the Post Office this morning, wondering how the hell to mail a big item in a small envelope, the most for the least, which is my personal motto, and the two young men who helped me were amiable and never even weighed the package, which was way overstuffed with expensive and luxurious Christmas gifts for my family. I now dig the way the French respond negatively to everything. The first answer, to every question, is “No.” That's cool. I was once a civil servant and I understand that the culture of “Yes” usually leads to more work. But once you break through the “No” barrier clerks and shop keepers are helpful. I do this by either acting completely stupid (not impossible), aggressive (easier), or friendly (a new and effective solution). I have coffee several times a week at a boulangerie on rue St. Antoine. Nice place, crowded and overheated, like much of the city, and the biggest goddamn croissants on earth. As big as my foot, but tastier. I enter, find a table, and the same young waiter asks for my order. After six weeks he began to interact, ask a few impersonal questions, toss off a joke. I figure, six weeks, that's a good time-frame. Now, most of his co-workers are pleasant, treat us like regulars and look us in the eye during short conversations. However, the cashier is a young woman, average to pretty in appearance, fashionable with black hair and fake-tanned red/orange skin, and she is completely self involved and dismissive and has never even been slightly affable. Huge croissants, though. Young people are loud, silly, attention-seeking and don't consider anyone over 40 of any importance whatsoever; old people talk to themselves, a lot, and clog up the line at the grocery store while middle-aged men and women watch each other with urban suspicion and distrust. At lunch yesterday on Rue de Turenne, our waitress asked us where we were from. We answered and she engaged and by the time we were finished with our meal, two hours later, we were exchanging Facebook info. I've done this before and I usually expect to have my bank account drained by Corsican cyber-pirates, but, so far, no one has asked me to sponsor their families for immigration or buy Amway products or save the Nigerian royal prince. I think they look at my Facebook page and decide not to pursue the relationship. I'm pretty comfortable with that. The weather. Today it's chilly and cloudy with a light rain. There was a little snow last week but I've only opened my umbrella about a dozen times in the past two months. I enjoy the cold and the dark, so the weather isn't much of a problem and I've learned to appreciate rain. 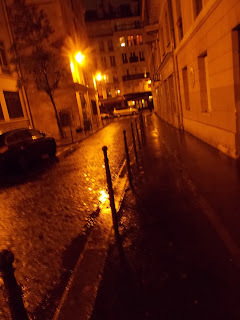 There are less people out when it rains, so walking around the city is easier, not as much contact on the street and when the lights reflect off of the pavement at night it looks mysterious and appealing; it could be anytime in the city's distant past. Dog owners are encouraged to clean up after their pets, but they don't. The droppings remain where they are deposited until an unaware pedestrian strides through. When I walk along the Rue de Rivoli, I see the stamp of a Gucci in the excrement and then, treading carefully, I notice the smudge becomes smaller and smaller as it disappears up the street. Sad that he never knew. Embarrassing and I hope I don't sit next to him at lunch. More people equal more dogs equal more merde. It's one of the universal truths of existence, like the overcrowded metro, and it's a good argument for birth control, both canine and human. So, why do I keep coming back to Paris? I was in a pharmacy last week, buying some much needed aspirin with codeine, (honestly, believe me, undetectable, no buzz, simple pain relief for a forty-year-old back injury, maybe a slight nodding, early to bed, but no bad behavior, or spilled drinks), and the helpful pharmacist asked why I was in Paris and not another big city. I told her that, for me, Paris was a large package; history, culture, literature, art. The fact is I can't exactly pinpoint why I love it here. I could be in Rome or London, but Paris has an important history: monarchy, revolution, empire, republic, world wars, student rebellion. The desire to understand the world in relation to history and politics continues, too. There is a show at Musée d'Art Moderne de la Ville de Paris at the Palais de Tokyo called “L'Art en Guerre”. It covers the art and artists of Paris before, during and after WWII and shows, through the art that was produced at the time, how the world changed. There are drawings and paintings from the concentration camps which are sad, alarming and, sometimes, beautiful. I wasn't that interested at first. As an American, born after the war, I am distant from it. America won, right? Too simple. Most of the whole goddamned World was involved and a lot of people, while they appreciated the peace accord, can never say they “won”. I was amazed by the painting, the cruelty and horror. The show impressed me deeply and I've begun reading about the war from the European point of view, which tells different stories than the ones we learned in school. Where else is there this much art? Impressionists, Renaissance geniuses,abstract art, mindblowing landscapes, still lifes and graffiti are everywhere. Wandering around the Louvre yesterday I eventually came across the paintings of Camille Corot, a painter about whom I know little. He is a link between neoclassicism and the impressionists and as I looked at his landscapes I felt like I was going to cry. Man, that is a very strange feeling for me, to want to weep when in the presence of beauty; to feel like weeping for any reason. It's one of the definitions of an aesthetic experience; people have been known to pass out or have seizures when overtaken by extreme sensual stimulation. Part of my reaction was that of an appreciative observer, of course, but I was also drawn into the pictorial representation of what I would like in my own life; serenity, purity, calm, nature, quiet, solitude. And I also realized that I already have that, if I want it, if I recognize it. So, my repressed tears were for beauty, desire and gratitude, which is a complicated cycle of feeling and something that I appreciate and haven't really experienced until I started traveling to Paris. The French writers of the Nineteenth century own the epic historical novel. If I had not read Victor Hugo, Alexandre Dumas, Emile Zola I would have missed some of the greatest reading experiences of my life. The 20th century giants, Jean-Paul Sartre,Claude Simon, Albert Camus, Simone de Beauvoir, Alain Robbe-Grillet, are stylists and scholars who have changed the way I write, read and think. My life is better and I am happier since I've been introduced to these authors and I don't believe I would have taken the chance to read them if I hadn't spent lots of time in the environment that has inspired discontent with the status quo, extraordinary stylistic experimentation, and the establishment of absurdity as an acceptable adaptation to the modern world. Oh yeah, and cheese. There is nothing like ripe Camembert. I don't think I'd ever experienced it until I came to Paris for the first time. I can tell when I'm within 30 feet of a decent round of real Camembert. It has the aromatic decay chain of Uranium-235 and even though it is sealed in waxed paper, tightly seated in a form-fitting wooden box, wrapped in plastic, stored at the bottom of the refrigerator, in a separate drawer, the fridge snugly closed and the kitchen shut and locked, I can still tell if I have any fresh Camembert on the menu when I walk in the front door. I love that. I will miss that.